Since the early 1970s, alternative birth advocates have tended to oppose themselves to mainstream obstetrics in terms of technology: in the influential formulation of anthropologist Robbie Davis-Floyd, the standard hospital model is “high tech/low touch,” while alternative birth is “low tech/high touch.” The emergence of the doula, a birth assistant who typically offers labor positioning, massage, and emotional support, has recently garnered attention for reducing rates of cesearean and other interventions. Doula care thus at first glance might seem to embody and even extend the opposition between tech and touch. In this talk, I call this binary into question by highlighting a growing movement of doulas of color who are achieving equitable birth outcomes in the face of medical and societal racism. Among other things, these doulas insist on access to empowered birth for communities of color and queer and trans people, and refuse both obstetrical overmedicalization and the fetishized notion of “natural” birth that has animated an overwhelmingly white midwifery and home birth movement. Drawing on recent accounts of feminist and Black radical deployments of technoscience, I argue that this mode of doula care itself functions as a crucial technology in the service of reproductive health and justice. 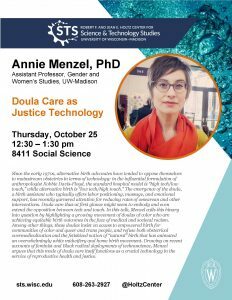 Annie Menzel’s research focuses on race, gender, and reproductive politics in North America. A political theorist with emphases on Black political thought, Black feminisms, feminist political theory, queer theory, and biopolitics, her work brings these literatures to bear on the histories and current shape of public health and medicine. Her book manuscript, The Political Life of Black Infant Mortality, is under contract with the University of California Press.